Judge Bender was appointed to the bench in February, 2017. Prior to taking the bench, Judge Bender served as a Chief Assistant Prosecutor at the Hamilton County Prosecutor’s Office, overseeing the Municipal Division. Over the course of her 23 years at the Hamilton County Prosecutor’s Office, Bender successfully prosecuted cases at the appellate, felony and municipal levels. Judge Bender is actively involved in the community, having served on the Elderly Services Advisory Board, the Cincinnati Bar Association Grievance Committee, Mock Trial, and St. Xavier High School’s Athletic Board. She often speaks to parent and student groups on a variety of topics including responsible social media use, criminal law and the court system. 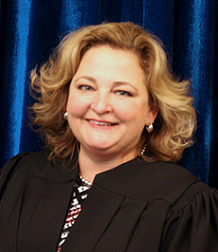 Judge Bender is a lifelong resident of the west side of Cincinnati, having attended C.O. Harrison and J.F. Dulles Elementary Schools and Delhi Junior High. She is a proud graduate of Seton High School (1984), St. Mary’s College (Notre Dame, Indiana) and University of Cincinnati College of Law. Judge Bender represents District 7, which includes the communities of Addyston, Cleves, Crosby Township, Delhi Township, Harrison, Miami Township, North Bend, Price Hill, Sayler Park and Whitewater Township.